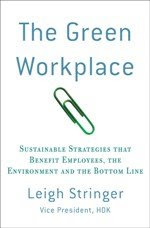 The Green Workplace: Is Your Grass Greener? 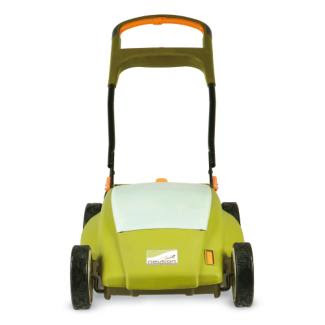 A co-worker sent me an image of this Neuton Mower from the swanky purveyor of modern goods, Design Within Reach. Of course, like many things DWR, this mower is only 'within reach' of those with plump wallets, willing to shell out $500 for a fancy mower. The price of the mower doesn't bug me at all, but the fact that it's touted as 'CO2 emissions free' does. It has a re-chargeable battery, which means that unless you have a PV panel or a wind turbine on your garage, you're probably just plugging it into your wall outlet, which is connected to the grid, which is connected in turn to something likely to be a coal-burning power plant. CO2 emissions free indeed. Just because the emissions aren't local doesn't mean they don't exist. So when my co-worker asked me if I thought this was truly green, I said, "maybe a little, but have you thought about one of these?" I was referring to good, old-fashioned push reel mowers. This is about as green as it gets, folks, no batteries or gasoline (or diesel) required! And the website for Clean Air Gardening says that they are easier to push than your grandpa's version. "Modern reel mowers are easy to push! Don't let anyone tell you otherwise. People who think they are hard to push usually haven't seen or touched a reel mower in 20 years. Check out our testimonials page to see for yourself." The good news? My co-worker surprised me with an e-mail this morning telling me he ordered the Scotts Classic Reel Mower at a sweet $129 (vs. the DWR version at $479) and is looking forward to tackling his physique while he tackles an overgrown lawn. Success! I'm writing because I noticed this blog post about the Neuton battery-powered lawnmower. Of course I understand your skepticism, which is why I'm inviting you to participate in a bloggers news conference regarding the Neuton mower. If you want more information about the lawnmower, or just want your questions and concerns answered, this is your chance! This call will address exactly those issues raised in your post. We believe that the Neuton is far more than just a product and is an example of what innovation combined with real environmental commitment can produce- and both its design and outreach efforts are instructive. You’ll be speaking with Neuton’s Tom Hughes – and there’s plenty to discuss. Among the issues: the engineering and development behind Neuton products and the creative and community-building marketing they’ve developed; as well as Neuton Clean Air Initiatives, including one in Southern California where over 16,000 residents have replaced their mowers with Neutons, cutting carbon emissions dramatically. Neuton is dedicated to making the world’s most innovative and dependable battery-powered lawn and garden equipment for people like you who care about the maintenance of their properties and the health of our environment. Consistent with these goals, a portion of Neuton profits is donated to community organizations working to clean our air. Join a select group of bloggers and interview the Director of Customer Relations at Neuton, Tom Hughes. After more than a decade working on major national and local grassroots political campaigns, Tom was inspired by Al Gore to join the fight on global climate change full-time. He joined Neuton in 2007. As the Director of Customer Relations, Tom helps people cut their carbon emissions every time they mow. At work, he enjoys working with government agencies that sponsor gas mower exchanges and telling the great Neuton Mower story to the media. When not at work, Tom tries to keep his own carbon emissions low by biking and hiking. This call is the first of a series of four calls to help prominent environmental bloggers like you discuss Neuton’s potential to reduce carbon emissions and greenhouse gasses, and how incredibly easy it is to use. Neuton battery-powered mowers are the #1 selling battery-powered mowers on the planet. · Why: To answer questions on the benefits of the battery powered Neuton lawnmower and to discuss additional efforts made by Neuton to increase the number of battery powered lawnmowers in local communities. The call will also address the overall effect Neuton products are having on our environment per year. We will also provide a podcast recording of the conference if you would like to post a link to that as well. Please RSVP, by email (madeleine [at] echoditto [dot] com) when you know if this is an opportunity that interests you. I just got a new battery powered mower (energy star, black & decker brand). I have to say it is quite awesome for mowing my lawn and the other townhomes on my block, and does not have the disgusting emissions of my old gas-powered mower (which i freecycled). All baby steps until I turn my lawn into a garden (HOA rules be damned)! Neuton is not America’s #1 Selling Battery-Powered Mower! It also is not American too if it is made in Taiwan. Here’s what I have to say about my Neuton experience; I wasn't impressed with the Neuton mower as I feel it was very poorly made design and is not better than the other competitors cordless mowers such as Craftsman, Black & Decker, Remington and etc. The Neuton to me was very weak on tall grass where my other mower a Remington can handle everything with its 60 volt battery without the cord or with cord. What I experienced from Remington was they answered the phone for me at 4am in the morning when I was looking for a better cordless mower which they answered here in USA (not in India) asking my questions 24 hours a day. I ordered it, I received it less than 2 days, they paid for the shipping and they sent me extra wheels, bolts and washers. When it arrived, I still had the Neuton, so I compared the 3 together in a test; the Remington blew the doors off the Neuton by far. I charged both mowers on a full charge, than ran both of them side by side for as long as they could go (taping the handles together so I could see which was longer), the Neuton ran about 52 minutes, the Remington lasted about 118 minutes. I charged the Neuton in one hour after my first test and did the same with the Remington; the Neuton ran for about 5 to 6 minutes, the Remington ran for 18 minutes. The Remington can fully charge almost in 4 to 5 hours, the Neuton needs 8 to 10 hours but Neuton requires taking out the battery, the Remington, just plug it in (and even mow & charge at the same time) and you can leave it there as long as you want without any issue (for months as the charger shuts itself off after a full charge). The other issue is the Neuton handles are not very strong, they feel like a beach toy, the Remington, Black & Decker & Craftsman handles are solid steel or feel more metal like than the Neuton does, this means when you have to turn it or lift it for mowing corners, you need strong durable handles. Neuton feels really weak as they flex too much. The idea of a cordless mower is to have the same strength and durability like a gas mower as the cordless are lighter but to have the same close professional cut and feel like a real mower. Neuton feels really less than a lawn mower when compared to a Remington, Black & Decker, and Craftsman. I felt the Neuton is like a trimmer more than a lawn mower because it was so light, floppy handles and an uneven cut. Customer service, Neuton is not open 24 hours, in fact it is only Monday through Friday Eastern Time only, Remington is 7 days a week. Black & Decker, Craftsman have 24 hour customer service but Monday through Saturday, closed Sundays. Remington, Black & Decker, and Craftsman were also rated higher in May 2008 Consumer Report magazine and was far better than the Neuton. Neuton was the second to the bottom of the list, Black & Decker is the first cordless mower invented and also was the best rated, second best is Craftsman but Remington is the strongest most powerful cordless & corded mower on the market and also it is the easiest to use. Neuton can’t cut as well next to Remington, Black & Decker, and Craftsman but I really like the Remington the best simply because the power, length of the battery, faster charging time, solid handles, more speed options, the design and by far better customer service. Also what I like about Remington, Black & Decker, and Craftsman too is they are USA made mowers, Neuton is made in Taiwan. Wages in Taiwan are about $.25 to $.55 cents an hour compared to the US; which is $6.00 to $8.00 dollars an hour in the United States. What amazes me, Neuton is based in Vermont but their mowers are made in Taiwan but their prices are the same price as Remington, Black & Decker, and Craftsman anyway, so they are using cheap labor versing US made mowers when they have a more expensive overhead on paying more on minimum wages in the US but they sell the mowers about the same price or cheaper than a Neuton but the Remington, Black & Decker, and Craftsman are better mowers anyway. I also noticed that Black & Decker was the first company who invented the cordless mower, they also were the first who started the gas mower exchange program too but Neuton has used their philosophy taking their version idea as if it was they’re idea instead of Black & Decker’s. I read several forum sites and noticed Black & Decker goes way back on history on the gas exchange programs before Neuton did. I also noticed that Remington, Black & Decker, Earthwise and Craftsman also do exchange programs together not based on only one exchange product mower, they allow each other to have people try them out at the gas mower exchanges by giving people a choice to pick and choose but Neuton is trying to only sell itself, not with other cordless mower products at these exchanges, that isn’t fair and says it isn’t all about being green, is it? Also Neuton doesn’t admit nor do they tell you that their mowers can cut everything, they don’t (they say 60 to 45 minutes). You have to buy the product first to decide if you don’t like it or not and if you don’t like it, you have to pay the shipping fee to return it, sure you get 6 months to use it but that they don’t tell you its limitations or compared to from gas or even electric. Remington, Black & Decker, and Craftsman don’t charge you a dime if you don’t like their mowers, so they offer a better guarantee than Neuton does as they charge you to return it. Remington also offers free parts on several things on their mowers without a charge and also they listen to their customers too. They improve there service and their products by any complaints reported sending feedback to their engineers by making things better. Sure this is common but Neuton is only a 2 model mower company; Remington, Black & Decker, and Craftsman are bigger and more reliable companies making all sorts of products besides mowers. Even though I agree with Neuton, going green is important but gas mowers still have a place in the market just like Hybrid cars, there are gas efficient mowers too. We can’t count those gas mowers out, many of these gas mower companies are USA made mowers which doesn’t help good old USA if you bash them out completely by swapping products made in China & Taiwan instead. When it comes to mowing, cordless mowers are not the best, Remington, Black & Decker, and Craftsman will admit that their customers that battery mowers can’t cut all their needs but Neuton, doesn’t always tell you that. If anything were second best to the power of gas mowers, it’s electric. No cordless mower can beat 120 or 220 volts. Electric mowers have been around for years (90 years), so if going green were the answer and saving money, cords beat the batteries any day. If you go cordless you have to replace batteries, electrics you don’t, that’s means corded are more green than battery because batteries wear out as you need to be dispose them & which also requires more manufacturing making more batteries. So if you want to use the Remington mower and your battery needs replacing, you can run on the cord as long as you like as batteries are expensive where you may never need a battery again. Also some people may not use very much gas anyway, so if you divide $100.00 for a 5 year battery, depending how much gas you need, gas may be just as efficient as a battery mower. Let’s say you spend about $10.00 a year filling your gas mower which if you mow about every 2 to 3 weeks lets say 1,000 square feet or less than 3,000 square feet, your gas mower would be cheaper to own. If you own a 1980’s gas mower but it still runs, you have to spend $300.00 to $400.00 on a battery mower and also replacing the battery in 2 to 5 years, you ending spending way more money for nothing. So spending more money than you would like as if gas is bad for the environment, so is manufacturing new mowers as it requires more fuel to make batteries & cordless mowers than gas mowers anyway. If people don’t need to replace them, it is also bad for the environment making more cordless mowers too. There are a lot of people who may use their gas mower seldom and may not need battery mowers anyway. What exchanges do is they make people spend money to exchange something they really may not need to exchange for or may not save the environment as environmentalist predict. How does Neuton know how much people use their gas mowers to pollute the environment? It is only an estimation, so trading or buying a battery mower may not equal its use to manufacturing more mowers to add to the problem by making more unnecessary mowers polluting the environment even more, that is a fact. Selling green and going green is a marketing tactic, so I don’t believe everyone should go buy a battery mower. Oil leaks or etc is a hair of the issue than using oil to manufacture machinery to produce more mowers by the thousands even the hundreds is actually worse. Personally cutting grass is less healthy than letting grass grow if the environment is an issue, same with like cutting trees, we don’t need to cut trees if we can save our old furniture and continue using it than cutting tree to make more furniture; same fact. However let me make my statement and say that the Neuton mower is not the best cordless mower product on the market (there are plus’s & negatives in all products) and it is not helping the US economy with outsourcing Japanese labor for US jobs nor is it really saving the environment if people are spending unnecessary money to produce more mowers if they are not needed; that creates more green house gases and air pollution. When you manufacture new mowers, you also pollute the environment by making them for unnecessary reasons as stated above. Sure the issue of going green is good but also saving US jobs to manufacture mowers here instead of Taiwan and making mowers with options without making more batteries or reasons to spend more money 3 to 5 years later, then making different mowers later on the market to sell something else. Again another marketing tactic to make money versing the real need to save the environment from pollution. I will admit, all companies want to make money by making more products by upgrading or changing ideas which also means buying again later when they don’t need to. You know the saying if it isn’t broken don’t fix it? That is so true! So my point is, Neuton will be a better product if you have ideas to make a product that doesn’t require changing, upgrading or purchasing something later if it doesn’t need to. Sell it once, let it last the customer 20 to 30 years without manufacturing more and make it in the United States where your company is located. If I owned an electric Lawn Boy mower and it was 30 years old or even a gas mower which if I use it less than 4 to 10 times a year, still works, not all people should be sold on going green if it not really necessary for everybody. Keep the old mower then, don’t try to sell them something if they don’t need it. If people buy and buy things they don’t need it, that is just as bad for the environment than trying to save it by doing something else. Lastly Tom Hughes from Neuton, start making your mowers in the United States, get out of Taiwan and help Americans by making your product here in this country, sell your product with a USA made label idea. That will sell your company with a good intention for pride in America but also make a product that doesn’t need any replacing or more manufacturing for the years to come. Make a corded mower or even a hybrid gas mower or a hydrogen mower which uses water instead of battery acid and also work with other USA made cordless mower companies so people have a choice to pick what they want. I throughly agree with the Neuton mower, I wasn't that trilled about it too. Battery just cannot do a great job next to an electric mower. I sampled a Remington mower myself and it out handled the Neuton. The problem with Neuton not selling them in stores, you can't sample them. When I went to Sears, I was able to sample a Black & Decker and Craftsman, they turned it on in the store for me and they said I can take it home to try it out also, same with Acehardware, they offer me a free trail on the Remginton mower too. I picked the Remington mower next to the Black & Decker for the option battery to cord, I really like that feature the most. I also throughly agree buying a American made lawn mower really makes sense too. Does anybody want to buy a Neuton mower, I got one for sale, I only used it twice? OK...I'm STUCK with a Neuton. And I use that word on purpose. But my latest problem is a battery not charging, and this after I replaced the battery (actually replaced the two cells within the battery) and also purchased a new charger. So what am I doing wrong, or what else can I try? Anyone have any suggestions? The Neuton tech folks have been very UNhelpful on this matter. I Want a Big Belly! Does Your Office Really Recycle? Is your company Green-e Certified? The UK - to have an eco-town makeover?